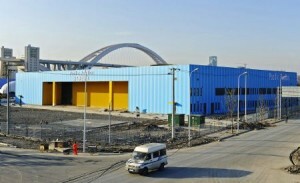 Pacific Pavilion is located in Zone B of the Expo site, and covers an area of 8,100 square meters. The pavilion will host exhibitions by Vanuatu, Papua New Guinea, Palau, Tonga, Micronesia, Samoa, Fiji, Cook Islands, Kiribati, Solomon Islands, Tuvalu, Marshall Islands, Nauru and Niue as well as the South Pacific Tourism Organization and the Pacific Islands Forum. The theme of Pacific Pavilion is “Pacific Ocean – Spring of Inspiration”. The pavilion will demonstrate the unparalleled natural beauty of Pacific countries, profound culture and sustainable lifestyle to provide inspiration for creating better city life. Exhibition arrangements inside the pavilion will be finished in early April. This entry was posted on Monday, February 22nd, 2010 at 11:07 am	and is filed under International Participants' Pavilion, Pavilion. You can follow any responses to this entry through the RSS 2.0 feed. Both comments and pings are currently closed.